People reading this blog might get the mistaken impression that I am fiercely opposed to carbon capture and storage (CCS) technology. That is definitely untrue. There are few things that would be more helpful than safe, cheap, and effective CCS. It would ease the transition to a zero-carbon global economy, and it would allow for the actual removal of CO2 from the atmosphere, through the growing and burning of biomass. All that said, it is deeply inappropriate for planners to count emissions reductions from anticipated future CCS in their plans, as the government of Alberta has done to an extreme extent. The technology is in its infancy. Indications to date suggest that it will not be as cheap as its biggest boosters hope. It may not be able to store carbon permanently or safely. Carbon capture certainly cannot do anything to mitigate emissions from mobile sources, making fossil fuel operations that generate fuels for them problematic. Emissions reductions from CCS should not be estimated until information on the costs and effectiveness of commercial operations are known. It should not be assumed that CCS will allow high carbon activities such as burning coal or harvesting the oil sands to continue. While some public funding for CCS may be justifiable (especially investigations into using it with biomass fuels), industry groups that are predicting heavy usage of the technology should bear most of the development and implementation costs. CCS doesn’t make coal ‘clean.’ Even if it reduces CO2 emissions by 80-90%, coal will still be a climatically unsustainable technology. There are also a large number of environmental hazards associated with coal mining, coal ash, and so forth. Coal will probably never be clean, and will certainly never be clean just because it has CCS bolted on. Likewise, CCS cannot redeem the oil sands. We must develop alternative plans, in case CCS proves to be ineffective, unsafe, or unacceptably expensive. As I have said before, we are in the Wright Brothers era of CCS technology, and it is far too soon to project whether it will be an important stabilization wedge or an expensive flop. It is definitely too early to be estimating the specific quantities of emissions that will be averted by as-yet-nonexistent technologies at unknown future dates. If emissions are going to peak and descend to safe levels, we are going to need a lot of stabilization wedges: efficiency, protected and enhanced forests, zero-carbon electricity and fuels, and more. If we want to have a strategy that can survive the failure of a few major initiatives, that means we need extra wedges for contingency. As such, we probably can’t reject technologies like CCS and the increased use of nuclear fission out of hand. 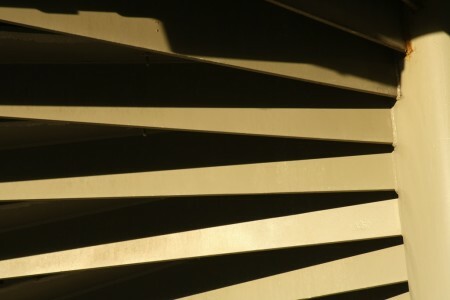 Nice photo – very abstract. A landmark Energy Department carbon sequestration effort broke ground this week as workers began drilling in Illinois for a project that could store 1 million metric tons of carbon dioxide in the ground by 2012. The storage capacity is small compared with the several billion tons of the greenhouse gas that humans emit each year, but the geology of the site makes the development exciting. The Mount Simon formation beneath Illinois, Indiana and Kentucky could eventually hold more than 100 billion tons of carbon dioxide. The demonstration in Illinois will test whether the 6,500-feet-deep formation can contain large amounts of the gas. Geologists are optimistic about Mount Simon because three layers of impermeable rock overlie the Mount Simon sandstone, where carbon dioxide will be stored, and the surface, leading scientists to believe it has great potential to contain the gas. Are you going to say anything about the potentially horrific acid-contamination of groundwater? That is one of many safety concerns. Personally, I am more worried about massive CO2 burps that suffocate everything nearby. It’s not like one isn’t related to the other – acid eats away at metal seals. My Clean Break column today takes a shot at the Canadian government for repeatedly touting carbon capture and sequestration as a panacea for the oil sands, while at the same time refusing to recognize — and support — the role that renewable energy can play. It comes on the heels of an appropriately critical National Geographic feature on the oil sands called “Scrapping Bottom,” and the recently yet repeatedly expressed belief of Environment Minister Jim Prentice that technology will save the day. Perhaps technology will helps prolong our days on this planet, but it won’t be carbon capture and sequestration, which is too expensive, unproven, inefficient and, in some applications, ineffective to tackle the ghost in Canada’s climate-change closet. By refusing to acknowledge the major role that other renewables can play to avoid these carbon emissions in the first place, and to do it more quickly and economically, Stephen Harper is sending Canada’s economy down a path that’s unsustainable. No one will deny that researching and investing in Carbon Capture and Storage (CCS) technology entails a risk. There is great uncertainty in the science, technology, and economics of CCS. The question that needs addressing is if CCS holds reasonable prospects for the future or whether it is a desperate measure to forestall change in the oil sands industry (since oil sands plants are the largest producers of carbon dioxide in Canada). The challenge of CCS is to capture gaseous CO2, apply the pressure necessary to liquify it (~50-80 bars or 5000-8000 KPal), inject the liquid in a deep, underground, stable hollow formation with sufficient capacity and seal this formation so the liquid remains trapped in perpetuity. This is neither easy nor cheap. Assuming an underground temperature of 40 degrees Celsius, the liquid CO2 will have a density of 500 kg/m3. This means that two million cubic meters would be required to store the amount of CO2 produced by Syncrude and Suncor in 2003. With increased production, more and more storage is needed, year in, year out. The same scenario must be assumed for coal-fired power plants and other large CO2 emitters. Can anyone guarantee, firstly, that we will always find an underground formation large enough and near enough to store all the CO2 produced by an emitter; and secondly, that the stored CO2 will remain underground in perpetuity? This is a challenge far more daunting then that of storing nuclear waste. Yet we are willing to bet vast sums on this, in order to allow oil sands to keep producing, whereas the nuclear energy industry was stopped for a more trivial problem. This is a political gamble based on fast and loose science and economics. A proper, realistic evaluation of the risk associated with CCS technology is warranted before any more money is spent on it. The idea that clean coal, or to be more specific, a technology known as carbon capture and storage (CCS), will save the world from global warming has become something of an article of faith among policymakers too. CCS features prominently in all the main blueprints for reducing greenhouse-gas emissions. The Stern Review, a celebrated report on the economics of climate change, considers it “essential”. It provides one of the seven tranches of emissions cuts proposed by Robert Socolow of Princeton University. The International Energy Agency (IEA) reckons the world will need over 200 power plants equipped with CCS by 2030 to limit the rise in average global temperatures to about 3°C—a bigger increase than many scientists would like. Politicians have duly lined up behind the idea. Barack Obama talked up CCS during last year’s election. Gordon Brown, Britain’s prime minister, has said the technology is necessary “if we are to have any chance of meeting our global climate goals”. The leaders of the G8, a rich-country club, want it to be widespread by 2020. Despite all this enthusiasm, however, there is not a single big power plant using CCS anywhere in the world. Utilities refuse to build any, since the technology is expensive and unproven. Advocates insist that the price will come down with time and experience, but it is hard to say by how much, or who should bear the extra cost in the meantime. Green pressure groups worry that captured carbon will eventually leak. In short, the world’s leaders are counting on a fix for climate change that is at best uncertain and at worst unworkable. New research shows that for millions of years CO2 has been stored safely and naturally in underground water in gas fields saturated with the gas. The findings – published in Nature today – bring carbon capture and storage a step closer. Ottawa will pump as much as $140 million into eight demonstration projects in Western Canada which aim to capture and store carbon dioxide produced by power plants and the fertilizer and petroleum industries. Projects in the Edmonton region include Epcor and Enbridge’s Genesee project and TransAlta’s Pioneer project, both in the Lake Wabamun area and both aimed at removing carbon dioxide from the flue gas of coal-fired power plants and injecting it into deep saline aquifers. A gas-fired generator in southern France will become the first retrofitted power plant in the world to capture, transport and sequester carbon emissions when it begins operation later this month. Total’s Lacq plant will retrofit a 30-megawatt boiler to use an oxyfuel technology that will enable it to capture 60,000 metric tons of carbon dioxide a year. The gas will be transported by a 50-year-old pipeline once used to take natural gas out of the ground — only now it is being pumped the other way, for storage 4,500 meters underground. A team of fossil fuel companies is looking 8,300 feet below pastures of Kentucky bluegrass for a place to store millions of tons of global warming pollution. At 4,000 feet, the drillers are halfway to their target — a 550 million-year-old rock formation that could absorb millions of tons of carbon dioxide emissions. The $8 million project is funded primarily by the state of Kentucky, ConocoPhillips, Peabody Energy and E.ON U.S., the parent of Louisville Gas & Electric Co. and Kentucky Utilities. Carbon storage carries high stakes for Kentucky, which is the nation’s third-largest coal producer and is 90 percent reliant on the fossil fuel for its electricity needs. “We don’t have a choice,” said Len Peters, secretary of the Kentucky Energy and Environment Cabinet. “We have to do this for coal to be a part” of the nation’s energy mix. The project’s success also has a lot to do with the viability of the companies involved. ConocoPhillips invested in the well because of the proposed Kentucky NewGas project, which seeks to turn coal into natural gas at a plant built atop an underground mine. ConocoPhillips has teamed up with Peabody for the project. BERGEN, Norway – The chairman of the U.N. Intergovernmental Panel on Climate Change urged the international community on Wednesday to develop more technologies for capturing and storing carbon dioxide as part of the fight against global climate change. Rajendra K. Pachauri, who shared the 2007 Nobel Peace Prize with Al Gore, said that underground CO2 storage is a “very attractive” technology for cutting emissions. “We need to move fast, we need to bring down costs, we need to do this in a much larger scale,” he said at the opening of an international conference about CO2 storage in Bergen, Norway. Carbon capture and storage, or CCS, is an experimental technology where carbon dioxide from fossil fuel plants is captured and stored underground. While proponents say it could help cut greenhouse gases from power plants by up to 80 percent, some environmentalists argue that it diverts resources from cleaner technologies and could involve the same leakage risks as storing nuclear waste. Proponents of Carbon-Capture-and-Storage (CCS) have long hailed the technology as the silver bullet that will enable the world to both fight climate change and keep using coal reserves. In Germany, the debate about the merits and pitfalls of this approach has once again surfaced. It highlights three key problems with using CCS to solve the climate crisis. Ordered from least to most damaging to the proponents of CCS, they can be summarised as: 1) The technological challenges in bringing the technology to large-scale applicability and the amount of money needed to reach this point. 2) The economic uncertainties over the competitiveness of CCS-generated energy vis-a-vis other forms of energy. 3) The opportunity costs of investing in CCS given the proven potential and fast growth rates of other renewable energy sources. In a consortia bid between Scottish Power, Aker Clean Carbon of Norway, which is developing the capturing technology, and Marathon Oil, the partners will work on the techniques to provide undersea installations, and the pipelines needed to transport and store carbon dioxide under the North Sea. Raytheon says it is testing a leak-proof method of keeping sequestered carbon dioxide buried deep in the ground — using some of the same technology it developed to increase production of oil from shale. The latest sequestration method involves encasing the gas in gel, pumping it underground, and then heating it with microwaves until the gel solidifies. The extraction technology, for its part, involves heating the shale with microwaves before pumping liquid carbon dioxide into the formations to separate kerogen, an organic precursor of oil, from the rock. In both instances, Raytheon partnered with CF Technologies of Hyde Park, Mass. CF Technologies specializes in so-called supercritical fluids, substances that share properties of both liquids and gases when subjected to high pressure and temperature. Carbon dioxide is commonly used as a supercritical fluid. It is conventional wisdom among People Who Matter that burning coal is going to continue, even accelerate, no matter what kind of legislation is passed or international agreements are forged. That’s why carbon capture and sequestration (CCS)—technology that buries power-plant carbon dioxide emissions underground—is widely seen as the bright, shining hope for maintaining a livable climate: it’s the only way to burn coal without frying the planet. Or it would be, if it were proven to work on a large scale. The American Clean Energy & Security Act recently passed by the House contains billions of dollars in subsidies for developing CCS technology, and effectively delays any serious domestic greenhouse-gas reductions for 10 to 15 years—by which time, it is hoped, CCS might be able to be scaled up to wide use. But does CCS technology actually exist? Is it practical? Affordable? Who’s working on it? Despite the flurry of chatter about CCS, these basic questions usually go unanswered. Q. Lots of the early work in CCS has been around injecting CO2 into oil wells to help extract more oil, known as enhanced oil recovery (EOR). How big of a role is that going to play? A. Some early opportunities for EOR can and should be explored. It’s not CCS, though, unless you’re storing the CO2 and monitoring it over the long time frame. Q. Are any EOR projects doing that? A. The Weyburn project, which takes CO2 from the Dakota gasification plant in North Dakota and takes it up to the Weyburn oil field, has had a strong research project associated with it that’s been tracking the CO2—using that as a platform to study CCS via EOR. Standard industry practices leave about a third of the CO2 underground. Harvard stunner: “Realistic” first-generation CCS costs a whopping $150 per ton of CO2 — 20 cents per kWh! 1. The costs of carbon abatement on a 2008 basis for FOAK IGCC plants are expected to be approximately $150/tCO2 avoided (with a range $120-180/tCO2 avoided), excluding transport and storage costs…. This yields “levelised cost of electricity on a 2008 basis is approximately 10¢/kWh higher with capture than for conventional plants.“ So pick your favorite price for new coal plants — Moody’s said last year that is about 11¢/kWh — and add 10¢ and you get 20+¢/kWh. Political Folly or Climate Change Fix? Every year the burning of fossil fuels pours 30 billion tonnes of CO2 into the atmosphere, a threat to climate security. Both the Alberta and Canadian governments have enthusiastically endorsed Carbon Capture and Storage (CCS) as a new and powerful tool to avert dangerous climate change. Industrialists, civil servants and university scientists generally agree that Canada won’t be able to maintain its standard of living or rate of fossil fuel consumption in a carbon constrained world without employing this controversial technology. Many sincere and credible scientists argue that CCS remains the best mitigation option to prevent global temperatures from rising above 2 degrees. Some environmental groups such as the Pembina Institute advocate for CCS as a bridging mechanism to reduce greenhouse gases while building and investing in renewable energy. The technology holds the promise of massive reductions in emissions but any success may ultimately be limited to a relatively few projects due to cost, liability, technology, scale and public skepticism. CCS may turn out to be another costly Faustian bargain and classic technical fix. The Bottom Line: Given the paucity of groundwater information in Canada and lack of national water standards, the push to accelerate CCS could pose real risks to our groundwater resources. In sum, the marriage of a brave new technology with a political fix for an immediate climate problem could have negative long-term consequences for Canadian taxpayers and water drinkers without stabilizing the climate. To move forward on the sequestration of billions of tonnes of carbon dioxide in underground saline aquifers without strong regulations, clear liability, effective oversight, sound science and a transparent decision-making process would be sheer folly. CALGARY — The individual pieces of a carbon capture and storage puzzle have been around for a while, but there’s a long way to go before those fragments can be assembled at a big enough scale and cheap enough to put a worthwhile dent in greenhouse gas emissions. “At large scale it’s not been done, and we need to learn how to do it in a much more cost-effective manner,” said Eddy Isaacs, executive director of the Alberta Energy Research Institute. The technology – which got a $865-million boost from the Alberta and federal governments last week – involves separating climate-change-causing carbon dioxide from industrial emissions and injecting the gas deep underground, rather than letting it escape into the atmosphere. Refineries, petrochemical plants and other industrial facilities have employed the “capture” part of the equation for some time, using special chemicals to scrub poisonous hydrogen sulphide and other contaminants from their emissions. When the Alberta government announced last week that it would be handing over $745 million to Shell Canada so it could move ahead with its Quest commercial-scale CCS project, and when the federal government said it would chip in another $120 million, it didn’t sit well with environmental and energy think-tank The Pembina Institute. It’s not that Pembina is against developing this technology. What it doesn’t particularly like, and I can’t help but agree, is the fact that the Alberta and federal governments’ are covering two-thirds of the cost for this $1.35 billion project, which will be designed to capture CO2 from the steam methane units at the Scotford Upgrader in Fort Saskatchewan. It’s part of the Athabasca Oil Sands Project, a joint venture among Shell (60 per cent), Chevron Canada (20 per cent) and Marathon Oil Sands (20 per cent). Rather than carry the load for the private sector, the government should be moving quickly to establish a cap-and-trade regime that would put a sufficient price on carbon, Pembina argues. Ultimately, polluters should cover the whole cost of CCS deployment and that will only happen when they factor in the cost of not doing so once carbon pricing hits their bottom line. Pembina also argues that the government shouldn’t be so narrowly focused on CCS that it ignores the much broader, and less risky opportunities out there. “In parallel to its support for CCS, the government needs to support a massive scale-up in renewable energy and energy efficiency, the most sustainable solutions to climate change,” it says. Plans for Britain’s first coal-fired power station equipped with carbon capture technology have been backed by the European Commission. The commission has recommended that a plant in Hatfield, near Doncaster, should receive £164m of EU funding. The sum would be matched by a similar sum from the UK government. If the plan gets the go-ahead it is thought 1,500 jobs will be created by the plant’s construction. Work would begin in 2010, for completion in 2015. The Hatfield scheme was judged as the third best in Europe by the commission. It beat off rival applications for money from the Longannet coal-fired station in Fife and a proposed new power plant at Kingsnorth in Kent. Is “we’re going to burn the coal anyway” an argument for carbon sequestration? 1. Sequestration is not a low-cost alternative. 2. Sequestration is not modification of existing infrastructure. “At the far end of the McKinsey curve – expensive per tonne reductions – is an approach favoured by Alberta, Canada’s largest provincial per capita emitter. There, the government has set aside $2-billion for carbon sequestration – capturing carbon and burying it. The McKinsey study says, yes, retrofitting coal-fired plants with carbon capture and storage or building new ones with that technology definitely removes carbon but at a high price per tonne. You can see this in Alberta’s first efforts. More than half of the $2-billion has been pledged to two projects that, if they work, will remove only 2.1 million tonnes of carbon, a tiny fraction of Alberta’s total emissions. “A new research paper from American academics is threatening to blow a hole in growing political support for carbon capture and storage as a weapon in the fight against global warming. “It is like putting a bicycle pump up against a wall. It would be hard to inject CO2 into a closed system without eventually producing so much pressure that it fractured the rock and allowed the carbon to migrate to other zones and possibly escape to the surface,” Economides said. Environmentalists claimed a victory over E.ON today when the German energy company confirmed it was shelving plans to build its Kingsnorth coal plant after years of protests. The company said it was pulling the project out of the government’s competition to build the first of four planned large pilot plants to demonstrate technology for capturing and storing some of the carbon that would usually be emitted into the atmosphere. Kingsnorth became a rallying point for environmentalists as it would have been the first new coal station to be built in the UK for decades. E.ON said depressed power prices made it uneconomic, becoming the latest bidder to withdraw from a race that now has just one company left in it. It means that no new coal plant will be built as part of the current carbon capture competition. The sole remaining contender – ScottishPower’s Longannet plant – is an existing coal power station on to which the CCS technology would be added. The provincial governR ment is expected to give the green light today to a $1-billion-plus clean coal project at SaskPower’s Boundary Dam generating station, which will be the first carbon capture and sequestration (CCS) project of its kind in the world. A media advisory issued Monday said Rob Norris, minister responsible for SaskPower, and SaskPower president and CEO Robert Watson will make “a major announcement on the future of electricity generation in Saskatchewan” at the Boundary Dam Power Station. The proposed $1.2-billion CCS demonstration project received $240 million from the federal government several years ago, of which about $180 million has been spent. But the CCS project has been up in the air due to lack of federal regulations affecting greenhouse gas emissions from coal-fired generating stations. In December, SaskPower announced it was proceeding with the $354-million rebuild of 150megawatt (MW) Unit 3 at Boundary Dam, the province’s largest coal-fired generating station. But the so-called “clean coal” project was put on hold, pending publication of federal regulations on greenhouse gas emissions at thermal generating stations. The regulations were expected to be published this month, but the federal election delayed their release. JOSH WINGROVE EDMONTON Alberta thrives on the strength of its oil and gas sector, while coal keeps the province’s lights on – as such, in an era where many demand lower emissions, the province is a carbon giant looking to change its ways. Choking the output of those industries, however, could be economically devastating. So rather than limiting the actual amount produced, the province has pinned its hopes on a process known as carbon capture and storage (CCS), which would see carbon collected and buried deep below ground. On Wednesday afternoon, Alberta Energy Minister Ron Liepert announced a final agreement on its third such CCS project. The province promised $2-billion in seed money three years ago, but only this year has approved projects. Calgary-based Swan Hills Synfuels LP aims to use an unproven method, coal gasification, to reach 1.4-kilometre-deep coal deposits in central Alberta, convert them to gas underground, capture the emissions before they ever see daylight and use the gaseous coal to run a power plant. The new plant would serve a whopping 300,000 homes while producing one-third the emissions of a similarly sized regular coal plant – or about the same carbon output as a natural-gas plant. Earlier this month, the Guardian revealed that Longannet, the only remaining project in the government’s competition for CCS funding was on the brink of collapse because Scottish Power and its partners, Shell and the National Grid, were concerned about its commercial viability without more public backing. Economist Debates: This house believes that climate-control policies cannot rely on carbon capture and storage. AS Helene Boksle, one of Norway’s favourite singers, hit the high notes at the Mongstad oil refinery on May 7th, the wall behind her slid open. It revealed, to the prime minister and other dignitaries present, an enormous tangle of shiny metal pipes. These are part of the world’s largest and newest experimental facility for capturing carbon dioxide. Such capture is the first part of a three-stage process known as carbon capture and storage (CCS) that many people hope will help deal with the problem of man-made climate change. The other two are piping the captured gas towards a place underground where the rocks will trap it, and then actually trapping it there. If the world is to continue burning fossil fuels while avoiding the consequences, then it will need a lot of CCS. There is no other good way to keep the CO2 emitted by power stations, and also by processes such as iron- and cement-making, out of the atmosphere. To stop global warming of more than 2°C—a widely agreed safe limit—carbon-dioxide emissions must be halved by 2050. According to the International Energy Agency, an intergovernmental body that monitors these matters, CCS would be the cheapest way to manage about a fifth of that reduction. To do this, the agency reckons, requires the building of 100 capture facilities by 2020 and 3,000 by 2050. Which is a problem, because at the moment there are only eight, none of which is attached to a power station. Another 28, mostly in North America, are under construction or planned. But some are likely to be cancelled—as happened on May 1st to a project in Alberta. CCS is thus having difficulty reaching escape velocity. But scientists at Lamont-Doherty Earth Observatory at Columbia University and other institutions have come up with a different way to store CO2 that might eliminate that problem. Their approach involves dissolving the gas with water and pumping the resulting mixture — soda water, essentially — down into certain kinds of rocks, where the CO2 reacts with the rock to form a mineral called calcite. By turning the gas into stone, scientists can lock it away permanently. One key to the approach is to find the right kind of rocks. Volcanic rocks called basalts are excellent for this process, because they are rich in calcium, magnesium and iron, which react with CO2. Iceland is practically all basalt, so for several years the researchers and an Icelandic utility have been testing the technology on the island. The project, called CarbFix, uses carbon dioxide that bubbles up naturally with the hot magma that powers a geothermal electrical generating plant 15 miles east of the capital, Reykjavik (Read more about it here). In 2012, they pumped about 250 tons of carbon dioxide, mixed with water, about 1,500 feet down into porous basalt. The CO2 was laced with a radioactive isotope and there were other compounds in the water that helped the researchers trace its spread into the rock. OTTAWA — An electrical plant on the Saskatchewan prairie was the great hope for industries that burn coal. In the first large-scale project of its kind, the plant was equipped with a technology that promised to pluck carbon out of the utility’s exhaust and bury it underground, transforming coal into a cleaner power source. In the months after opening, the utility and the provincial government declared the project an unqualified success. But the $1.1 billion project is now looking like a green dream. Known as SaskPower’s Boundary Dam 3, the project has been plagued by multiple shutdowns, has fallen way short of its emissions targets, and faces an unresolved problem with its core technology. The costs, too, have soared, requiring tens of millions of dollars in new equipment and repairs. “The documents showed that the system was working at only 45 percent of capacity. One memo, written a month after the government publicly boasted about the project, cited eight major problem areas. Fixing them, it said, could take a year and a half, and the memo warned that it was not immediately apparent how to resolve some problems. A chart covering the first year of operation showed that the system often didn’t work at all. When it was turned back on after shutdowns for adjustments and repairs, the amount of carbon captured sometimes even dropped. The repeated shutdowns have caused SaskPower to miss multiple carbon dioxide deliveries to Cenovus Energy, the Canadian oil company that signed a 10-year contract with the utility to buy most of the gas. (Cenovus uses carbon dioxide to force oil from largely depleted wells.) SaskPower has had to pay 7 million Canadian dollars in penalties, offsetting most of the 9 million Canadian dollars in payments received. Fully 101 of the 116 models the Intergovernmental Panel on Climate Change uses to chart what lies ahead assume that carbon will be taken out of the air in order for the world to have a good chance of meeting the 2°C target. The total amount of CO2 to be soaked up by 2100 could be a staggering 810bn tonnes, as much as the world’s economy produces in 20 years at today’s rate (see article). Putting in place carbon-removal schemes of this magnitude would be an epic endeavour even if tried-and-tested techniques existed. If the market will not provide an incentive, governments could. The case for a proper price on carbon (this paper has favoured a tax) is strong. Its absence is one of the reasons carbon capture and storage has not taken off as a way of reducing emissions from fossil-fuel plants; the kit needed can double the price of electricity. Yet, setting a price high enough to encourage negative emissions would asphyxiate the economy. Being able to remove carbon dioxide from the atmosphere is, therefore, a crucial element in meeting climate targets. Of the 116 models the Intergovernmental Panel on Climate Change (IPCC) looks at to chart the economically optimal paths to the Paris goal, 101 assume “negative emissions”. No scenarios are at all likely to keep warming under 1.5ºC without greenhouse-gas removal. “It is built into the assumptions of the Paris agreement,” says Gideon Henderson of Oxford University. Climate scientists like Mr Henderson have been discussing negative-emissions technologies (NETs) with economists and policy wonks since the 1990s. Their debate has turned livelier since the Paris agreement, the phrasing of which strongly suggests that countries will need to invent new sinks as well as cutting emissions. But so far politicians have largely ignored the issue, preferring to focus on curbing current flows of greenhouse gases into the atmosphere. NETs were conspicuous by their absence from the agenda of the annual UN climate jamboree which ended in Bonn on November 17th. In the short term this makes sense. The marginal cost of reducing emissions is currently far lower than the marginal cost of taking carbon dioxide straight from the atmosphere. But climate is not a short-term game. And in the long term, ignoring the need for negative emissions is complacent at best. The eventual undertaking, after all, will be gargantuan. The median IPCC model assumes sucking up a total of 810bn tonnes of carbon dioxide by 2100, equivalent to roughly 20 years of global emissions at the current rate. To have any hope of doing so, preparations for large-scale extraction ought to begin in the 2020s. The technologies that exist today, under development by companies such as Global Thermostat in America, Carbon Engineering in Canada or Climeworks of Switzerland, remain pricey. In 2011 a review by the American Physical Society to which Ms Wilcox contributed put extraction costs above $600 per tonne, compared with an average estimate of $60-250 for BECCS. However, the falling price of solar panels was a result of surging production volumes, which NETs will struggle to replicate. As Oliver Geden of the German Institute of International and Security Affairs observes, “You cannot tell the green-growth story with negative emissions.” A market exists for rooftop solar panels and electric vehicles; one for removing an invisible gas from the air to avert disaster decades from now does not.